Igniting in 2005, the discussion about highly leveraged transactions conducted by financial institutions became a matter of great controversy in German politics as well as in the media. Fuelled by an influential voice in politics, LBO firms became the face of capitalism’s evil by calling them a “Heuschrecke”, an animal much feared in history for its exploitive behaviour and risks to the mediaeval agrarian economy (Die Zeit, 2005). In terms of today’s Heuschrecke, according to public voice, downsizing and raiding represent the major risks attributed. Empirics show that the risk of downsizing in LBOs is falsified and that the occurrence of raids is rather irrelevant in today’s buyout universe. However, even if both risks held, each would exhibit a comparably low impact on the economy as a whole. Contrary, the empirically evident high-impact risk of over-indebtedness in leveraged transactions is widely neglected. The negligence of this risk-issue is dangerous, particularly with regard to the recent developments in the LBO industry, debt capital markets and the world’s economy. First, analysing the latest LBOs conducted, it appears that the historical failures, such as the buyouts of Revco and RJR Narbisco are widely forgotten, as gearing ratios have become aggressive again. Second, the subprime crisis, which was exported from the US real estate sector into global capital markets, caused liquidity shortages - AA rated banks were not willing to lend money to their equally rated peers anymore - which led to a credit crisis. This credit crunch provoked that, even though in the US the prime rate has been reduced by 50 bp, and in the Eurozone the prime rate was not increased as planed, ‘money became expensive’; FIBOR, LIBOR and EURIBOR sharply increased and remained high. This resulted in high debt funding costs. Third, taking a look at the world economy, America might face an economic downturn in the near future with decreasing consumption and increasing inflation. Furthermore, political tensions e.g. between the United States and Iran can quickly lead to an increase in commodity prices. Each of the three aspects alone increases the default risk in a highly leveraged firm. In a scenario where all three jointly appear, the probability of default will sharply increase. The American economy runs into recession. Owing to strong global interdependency’s in trade, the US recession causes a worldwide economic downturn. Diverse states further lower their prime rate to counteract, inflation rises, however inter-bank-offer rates remain unaffected. As a consequence, LBO transactions will increasingly run into default. This will further worsen the economic climate. After several defaults, the LBO fim’s will be unable to hide “the walking wounded”, thus, investors in LBO funds will want to rescue their money. An “LBO fund run” starts. However, LBOs are illiquid investments, particularly in a economic downturn as secondary buyouts and IPO activity will converge to zero. In addition to the risk named, the threat an LBO imposes on global debt capital markets is evident, therefore, it can not be ignored any longer in Europe. While it was already heavily discussed in America’s late 80s and early 90s buyout-boom, it slowly gains prominence in discussions LBO transactions. In the face of the concrete course of the investigation, the first three chapters will shed light on the buyout itself and will discuss critical issues in the deal’s structure. The components described in the section are chosen with regard to their high importance for the success of the deal and the risks involved. The fourth chapter mainly discusses the risks encountered by investors, companies and the financial system with regard to LBO transactions. 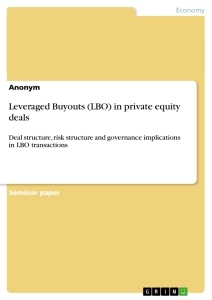 Finally, the last part of the paper deals with governance implications in LBO transactions. In particular, the quest for stronger regulations is investigated and the practical relevance of Jensen’s free cash flow hypothesis is evaluated. Analysing recent buyouts, a broad band of deals can be observed. While in some deals a public company is taken private, in others a privately held company is subjected to acquisition. However, all buyouts observed feature three main attributes, namely high gearing1, constrained lenders' claims2 and high return on the equity invested3. Therefore, for the purpose of this paper, buyout is defined as “an undertaking by private investors, including a buyout fund, members of the management team and sometimes also employees, to acquire a company or the subsidiary of a company through a large amount of debt capital, secured by the target company's assets, and a small amount of equity” (Meier, 2006, pp. 14-15; Wright, Robbie, Thomson & Starkey, 1993, pp. 30, 216; Achleitner & Fingerle, 2003, p. 3; Easterwood, Seth & Singer, 1989, p. 30). A 100% equity financed pencil manufacturer constantly produces a cash flow of $20m. After market screening, due diligence, valuation and strategy development, the deal is signed and closed. As financial structure for the firm and for the payment of the transaction amount to $100m, the LBO firm contributes $30m equity and $70m in debt. After the acquisition, the LBO firm advises the acquired firm’s management to strictly focus on the generation of cash flow. This strict focus leads to improved operations, superior asset utilisation as well as more efficient capital investments which increase the firm’s free cash flow to slightly over $26m. Furthermore, it is decided that the cash flow is primarily used to pay off the $70m debt facility since the tax shield can be fully used by following this strategy. Since it is a highly leveraged transaction, it is furthermore assumed that the average interest on debt is prime rate plus a 500 bp spread, leading to an interest rate of 10% per annum. Calculating the debt service on the data provided, the target will have paid off the entire facility within five years. Assuming that the firm is sold for the former purchase price, $100m, at exit point the former $30m equity stake is worth $100m. The LBO fund receives a capital gain of $70m solely through a strict cash flow focus and the use of high gearing. A leveraged buyout is composed of four major sequent components. The process is initiated by the deal flow and screening phase. Less than 30% of the former screened potential targets become analysed more detailed in the due diligence and acquisition phase (Gröne, 2005, pp. 14-15). The due diligence and acquisition phase is terminated by either a ‘no-go’ or the signing and closing of the acquisition. After a successful closing, the monitoring and advising phase - which last for 3 to 7 years - commences and ends when a carefully planed exit is executed. Although a buyout fund contributes major key factors to the transaction, such as excellent funding abilities, extensive networks, market knowledge and experience, not every firm represents an ideal target for a leveraged buyout. In order to find out which firms represent targets, “the buyout process begins with a ‘target selection’ phase, in which the LBO firm screens the market for investment opportunities meeting the rigid criteria for a successful LBO candidate” (Loos, 2006, p. 14). These can be classified as financial and business criteria (Loos, 2006, pp. 12-14; Gröne, 2005, pp.12-13). Financial criteria play the key role in deciding whether an LBO can be conducted on the target or not, since it evaluates the credit worthiness of the target’s business. In this evaluation, strong, stable and predictable cash flows are the most crucial issue because the target must be able to cope with high gearing (Graebner, 1991, p. 19). Second, the potential target must possess non-core assets which can be sold in order to quickly obtain liquidity (Loos, 2006, p.13). These non-core assets serve as a safety net since the high financing cost caused by extensive gearing must be paid regardless the operational success of the business. As a third aspect, “a history of demonstrated profitability and the ability to maintain above average profit margins” is essential (Loos, 2006, p. 13). KKR, 1989, pp. 2-5). This is fact, since profit margins are closely related to free cash flow and thus essential. Furthermore, profit margins must be high since changes in the industry can lower the margins at any given point in time. With regard to financial criteria, each is based on assumptions, estimated predictions and historical data; stable cash flows can change in the future, there might be no potential buyer for the non-core assets, and high profit margins may have been fact solely in the past. Besides financial criteria, business criteria are the second layer that needs to be assed before a transaction is conducted. With regard to these criteria, it is essential that the target feature’s a well-known brand name as well as a strong market position. This is crucial since both contribute to the stability of cash flow generation, play a key role when selling the firm at the exit and feature downside protection in terms of competition. Second, it is essential that the target operates in a non-cyclical industry particularly regarding the recent economic development since the risk of cash flow shortage ‘in the wrong moment’ must be avoided. Third, the target’s technology mix must be stable and not subject to rapid technological change. Fourth, the target must have a realistic and viable business plan as well as a competitive advantage (Loos, 2006, p. 13). After the target has been selected, a due diligence is performed, the terms of the transaction are negotiated, the holding structure is developed, plans and contracts with the current or potential management are made, and a detailed financial package to pay for the acquisition is developed. The due diligence is performed in order the gather all necessary information related to the target in order to make an appropriate offer. A due diligence consists of three major components, namely the basic due diligence, the external due diligence and the strategic due diligence (Picot, 2005, p. 295). In the basic due diligence all publicly available data about the firm is gathered and analysed (Picot, 2005, pp. 295-296). The external due diligence focuses on the analyses of economic issues related to the firm as well as the markets the firm is operating in. The strategic due diligence can be subdivided into marketing due diligence, human resource due diligence, legal and tax due diligence, environmental due diligence and financial due diligence. With regard to the components, the financial due diligence and the marketing due diligence represent the major issues with regard to an LBO. The financial due diligence aims at analysing the balance sheets, profit and loss accounts, cash flow statements, and all other internal, financial data relevant for the acquisition (Picot, 2005, p. 298). Hence, it analyses if the target features all relevant financial criteria. The marketing due diligence is closely liked to the financial due diligence, it focuses on the chances and risk associated with the target itself and the target’s market (Picot, 2005, p. 301). Thus, is serves as tool to evaluate upon the target’s business criteria. The acquisition of a target can be conducted as asset deal or as share deal. In a share deal, the legal entity, with all its “liabilities, including contingent and unknown liabilities become the responsibility of the buyer” (Michel & Sharked, 1988, p. 256; Picot, 2005, p. 139). Contrary, in an asset deal only specifically named and valued assets of the target are bought while legal agreements, such as contacts, are excluded; they can only be included if renegotiated by the respective parties involved (Michel & Sharked, 1988, p. 249; Picot, 2005, p. 141). Comparing the two acquisition structures, each features advantages and drawbacks, yet “there is no 'best' structure for all leveraged buyouts” (Michel and Shaked, 1988, p. 247). While an asset deal needs exact specification and thus consumes time, a share deal is performed comparably fast. However, since an asset deal demands precise specification, it is the safer transaction for the fund because it assures that no claims are overlooked which would obligate the fund in a share deal. Analysing the general concept of LBO transactions, diverse and strongly varying holding structures need to be evaluated in each respective context. Since each transaction is unique, the parties’ interests and the financial structure determine which structure will be applied. However, the most crucial element of each structure is that the interest costs for the debt facility must be entirely tax deductible, thus, the structure is always mainly tax driven. “It is the relative importance of tax, legal and general considerations which determine the 'best' structure for an LBO” (Michel & Shaked, 1988, p. 276). However, the general concept of each holding structure is equal in all transactions. The LBO firm and other equity investors i.e. the target’s actual management, or the target’s future management found a joint acquisition vehicle. This acquisition vehicle acquires the company by using the equity provided by the founding parties and the debt borrowed by the banks. Hence, the target does not appear directly in the LBO fund’s balance sheet but is solely listed as an equity investment in the respective holding. This structure eases the sale at a later point in time as well as the distribution of return. Furthermore, the holding structure sharply decreases the LBO fund’s risk of becoming directly liable in case of a target’s default. The holding structure is furthermore used to structural subordinate the debt used in the transaction’s financial structure. With regard to the financial structure of a buyout, each form is financed through high gearing and a rather low equity stake. This superficial assumption is in line with the findings of Paulson (2001), who states that debt and mezzanine contribute 70 to 90% to the transaction sum (p. 143). Anyhow, each buyout exhibits its unique parameters, meaning that not every target is able to cope with the same gearing level and not every buyout fund is able, or willing to contribute the same amount of equity to the transaction. The trade-off between high returns caused by excessive leverage and increased default risk should be carefully evaluated.5 Consequently, each buyout’s financial structure must be developed individually. However, since leverage serves as a tool to generate value in the buyout, the share of debt will be maximised with regard to the respective circumstances, and equity will only represent a fraction since its main purpose - besides the alignment of interest of the management team and the LBO fund - is to allocate the return generated through leverage to the entitled party. In terms of mezzanine, it plays a key strategic role in the buyout, yet in terms of funding, it has a minor role compared to the total amount of finance needed. Referring back to the superficial statement that each buyout is financed through a large sum of debt and a fraction of equity, it holds, yet neglects the true complexity of the peculiarities used in a leveraged buyout. In terms of debt, which serves as value driver, senior loans, subordinate loans, private placements and junk bonds play the primary role in buyouts. Usually, the major debt stake is contributed as senior and subordinate loan. Private placements as well as junk bonds6 are only used in large transactions and hold a minor stake. With regard to the respective interest rates, senior loans receive the lowest, while junk bond holders receive the highest. This can be explained by the fact that with increasing risk, interest rates must rise. Since the entire debt facility is solely secured by the target’s assets, none of the lenders holds a claim against the LBO firm in case of insolvency (Neff, 2003, p. 42; Michel & Sharked, 1988, p. 244). Owing to this, the diverse lenders are ranked regarding their rights and settlement. Senior lenders' claims are met first. Afterwards, the subordinate lenders' claims are met, and if the amount generated through the liquidation still exceeds both lender groups’ claims, private placements and junk bonds claimholders are paid. This structural subordination is, however, again dependant on the holding structure, for example while the senior facility is borrowed and secured directly by the target’s operational business the high yield notes are usually issued by the holding. The interest rate for senior and subordinate loans varies from 100 to 300 bp above the prime rate, yet the rate paid on the subordinate always exceeds the one of the senior facility (Graebner, 1991, p. 29; Michel & Shaked, 1988, p. 183; KKR, 1989, pp. 1-5). With regard to the rates paid for private placements and junk bonds, they vary strongly since the risk exposure differs from deal to deal, yet they are considerably higher than those paid on a subordinate facility (Altman, 2002, pp. 299-300). Mezzanine has the purpose of aligning the interest of the parties involved and the purpose of increasing some parties’ return in an LBO. It is a hybrid, since it is constructed through debt and equity, and it provides its holder with the equity’s potential and a minimum level of debt’s downside protection e.g. through interest payments (Michel & Shaked, 1988, p. 187; Graebner, 1991, p. 29). Regarding equity in buyouts, common stock and preferred stock are used. Their proportion differs from deal to deal. While both forms represent ownership, their respective rights as well as their potential payoff differ. In terms of their return, both are priced according to the CAPM and in the case of a buyout can be considered as high risk investments yielding high returns. According to a study conducted by KKR, their fund generated an average annual return of 40% from 1976 to 1988 (KKR, 1989, p. 4). Besides the return, the holders of common stock have the chance to receive a dividend while the holder of preferred stock receives a cumulative payment, meaning that “unpaid dividends cumulate and must be paid in full before any dividends may be paid to holders of common stock” (Bodie, Kane & Marcus, 2005, p. 47). As an example of the complex financial structure, the buyout of Macy's, America’s ninth largest retailer back then, serves as an ideal example. The financial structure of the buyout was composed of $65m cash, $17.5m common stock, $282.5m preferred stock, $795m first senior loan paying prime rate plus 150 bp for the first five years and 50 bp for the last two years, $225m second senior loan with identical payoff structure, $15m revolving senior working capital loan, $800m mortgage backed loan paying 11% interest, $121.5m notes to insurance companies yielding 13.5% interest, $400m subordinate loan paying 14.5%, $450m private placements yielding 15.5%, $250m discount debentures with a coupon stating that 16.5% interest was paid after the senior facility had been paid off. High returns of up to 16.5% on debt reflect the high risks involved for the lenders. This aspect sometimes is, however, neglected. There is no “free lunch”. After signing and closing of the acquisition the target becomes part of the LBO fund’s portfolio and the monitoring and advising phase starts “in which the LBO firm swiftly exercises newly gained influence on managerial decisions of the buyout target” (Loos, 2006, p. 16). The LBO fund can either act as hands-on, or more common, as hands-off fund. While the former directly participates in the strategic and operational management of the portfolio company, the latter only provides guidance, yet allocates the responsibilities of the operational business to the portfolio company’s management (Loos, 2006, p. 16; Kester & Luehrman, 1995, p. unknown). However, in each of the two strategy’s, the LBO fund performs austerity programmes, actively manages both sides of the balance sheet and assures a change in financial focus of the company's management team from earnings to cash flow, and fosters growth (Loos, 2006, p. 16). With regard to the cash flow focus and austerity programmes, cost reductions are performed and the asset utilization is improved. In terms of the former, incentives as well as pressure for the top-management to generate higher cash flows and improve operating performance is increased7, overhead cost are cut, firm’s internal bureaucracy is minimized, decision making is accelerated and simplified, and corporate functions are made leaner (Loos, 2006, pp. 24-25). In terms of active balance sheet management, the LBO Funds restructures both the portfolio firm’s assets liabilities. Concerning the firm’s assets, the fund “slashes unsound investment programmes and disposes assets that are unnecessary or underutilised” (Phan & Hill, 1995, p. 704). Regarding interest bearing liabilities, the buyout changes the entire financial structure. The monitoring and advising phase ends with the planning of a divestment strategy, known as exit. The exit serves to sell the portfolio company - fully or partially - with the purpose to reduce risk exposure and to transform illiquid investments into realized returns (Povaly, 2007, p. 117). The exit is, in accordance with literature, timed two to five years after the closing has taken place (Gompers & Lerner, 1999, p. 246; Lerner & Hardymon, 2002; Bottazzi & Da Rin, 2002; Giot & Schwienbach, 2003). 1 Cf. Brealey & Myers, 2005, p. 1067; Pohlhausen, 2003, p. 6. 2 Cf. Machiraju, 2003, p. 180; Pohlhausen, 2003, p. 6. 3 The statement “high” is in accordance with literature that specifies 30 to 40% return on equity in LBOs which is higher than the returns on the S&P 500. “During the 1990s, for instance, venture capital (here: venture capital covers both buyouts and seed finance) funds earned an average return of 29.5%, compared to the S&P 500's annual return of 15.1%“ (Damodaran, 2003, p. 308). In accordance with Loos (2006, p.14), “LBO firms generally target a 25-35% IRR in buyout executions.” Cf. Machiraju, 2003, p. 180; Brealey & Myers, 2005, p. 1067; KKR, 1989, p. 4. 4 General idea derived in accordance with Baker & Smith, 2006, p. 60; Data: Own model Appendix, Scenario 1. 5 This trade-off is discussed in more detail in section 4.1.1. 6 Bond specific risks are examined in section 4.3.4. 7 See section 5.4 for an in-depth discussion on this issue. Corporate Finance. Summary of "Principles of Corporate Finance" by Brealey et al. (11th edition)"